You’re cautiously walking through a darkened ally when a thug steps in front of you with a gun and asks for your wallet, your heart begins to pump ferociously when suddenly a dark caped figure drops down from the sky, disarms the thug and saves your life, as your hero is about to leave you thank him and ask who he is, to which he replies “I’m Batman”, that’s the kind of adrenaline pumping excitement you can expect from The Dark Knight Slots. 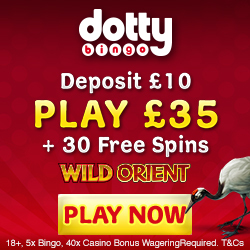 Mobile Bingo Bonuses bring you The Dark Knight Slots game which is another in a long line of Hollywood blockbuster related casino games from Microgaming and gives you lucky player’s 243-ways to win. Microgaming have managed to capture the dark, gritty tone of the movie, as well as incorporating some of the core characters as symbols throughout the game, including Rachel Dawes, James Gordon and of course the late Heath Ledger’s creepily scary portrayal of The Joker, there are also the ingenious Cinematic Spins which offer up a uniquely enthralling gaming experience. As well as some innovative features, which we’ll tell you about later, The Dark Knight Slots also carries the classic bonus symbols that accompany most modern video slots. The wild symbol is represented by the Batman logo and substitutes for all symbols, with the exception of the scatter symbol, it appears stacked on the reels both during the base game and the games. There’s also a scatter symbol, which is represented by a version of The Dark Knight Logo, line up 3, 4 or 5 of these graffiti symbols anywhere on the reels to trigger the games with players being awarded 15 bonus spins with a 2 times multiplier. 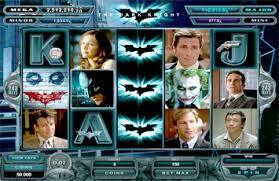 The innovative feature of The Dark Knight Slots that we mentioned earlier is the surprise bonus, which can pop up anytime and completely at random and feature Batman and the Joker, they appear on screen to carry out various tasks that inevitably end up in you winning more money. 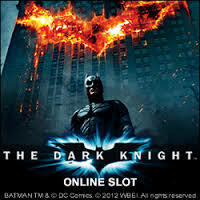 The absolute biggest incentive has to be four progressive jackpots attached to The Dark Knight online slots game, in this randomly triggered jackpot game you are required to spin the Bonus Wheel in order to win one of the four progressive jackpots. 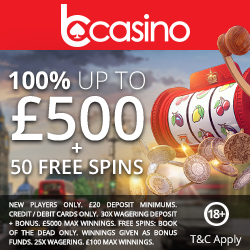 The Mini Progressive Jackpot starts at £10, the Minor Progressive at £100, the Major Progressive at £10,000, but the biggest prize pot, the Mega Progressive Jackpot, starts at a mouth-watering £1,000,000. You have to go a long way to find anyone who is disappointed with The Dark Knight slots, with a full Hollywood cast, a great selection of bonus features and life changing progressive jackpot, this game is a must play.